Have you heard the news? Mimi will be the first to tell you. 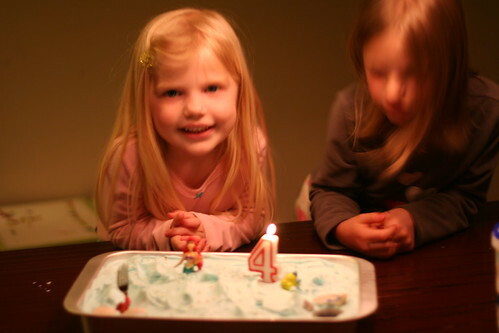 SHE'S FOUR! Sometimes she will help you with the math a little. "I used to be FWEE and now I AM FOUR!" "And look! 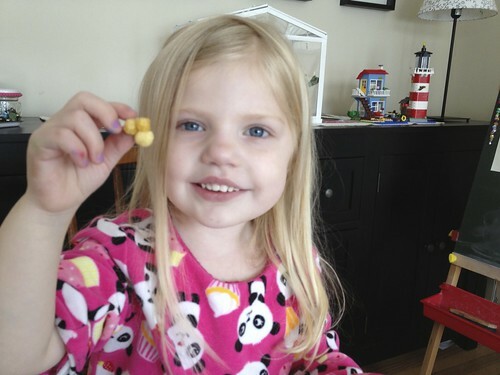 I found a hidden Mickey in my Kix!" AN ARIEL CAKE WITH ARIEL ON TOP! My favorite part is when Brent tells her to elaborate. She has obviously not thought beyond ARIEL. And frankly, my dear, she doesn't give a damn what flavor her cake is. Which is fine with me, I like a little artistic license. 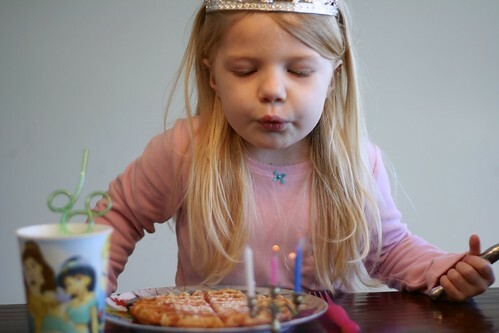 Here she is having waffles with pink sugar on top for her birthday breakfast. Note the traditional birthday candelabra. And the cake! NAILED IT!! I made a jello poke cake with blue raspberry jello. Then I frosted it with Cool-whip with just a dash of blue jello in it to turn it blue. Then it definitely has ARIEL ON TOP (and Flounder and Sebastian, and a tiny cocktail fork for a dinglehopper). I put seashells on and used real frosting (not Cool-whip) to stick little cake decorator pearls in them. I know she said green before, but then we did blue so it would look like the ocean. And also because green jello is grooo-ooo-sss. She loved it. If I made it again I would definitely use strawberry jello and just frost it with the blue. Blue raspberry jello was not my favorite. Anyway. Back to the birthday. 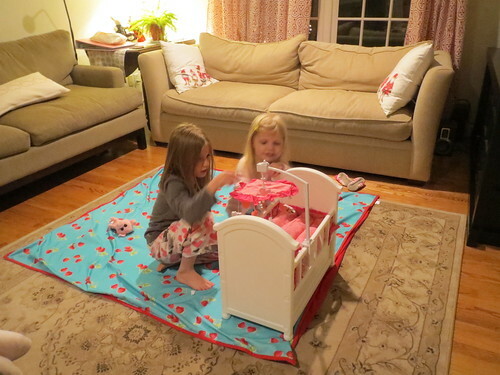 For her presents, she got the Bitty Baby crib from mommy and daddy. Bella and I went to the dollar store and spent about $6 and Bella was able to give her a whole bag of stuff plus a card and a balloon. That is definitely a new tradition because both the girls were just tickled that Bella had shopped and picked everything out herself. 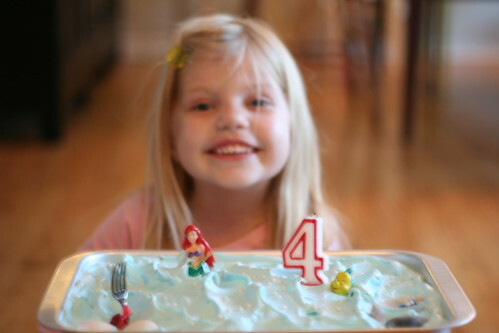 I asked Mimi what the best part of being four was, and she said it was moving to the pre-K room in her little school. The first week she came home with my favorite art project ever... a brown circle with her name on it. "I'm a little mud puddle!" You mean a big four year old mud puddle! !